Please read Cruise to Stockholm and Twilight in sunset and moonrise first. The next morning, by the time we woke up, we could see that we had already entered the archipelago of Sweden and the ship was just skirting around zillions of small little islands to reach Stockholm, the capital. After quickly freshening up, and grabbing a pizza slice yet again, we again rushed to the sun deck to catch a glimpse of the slightly different looking panorama. 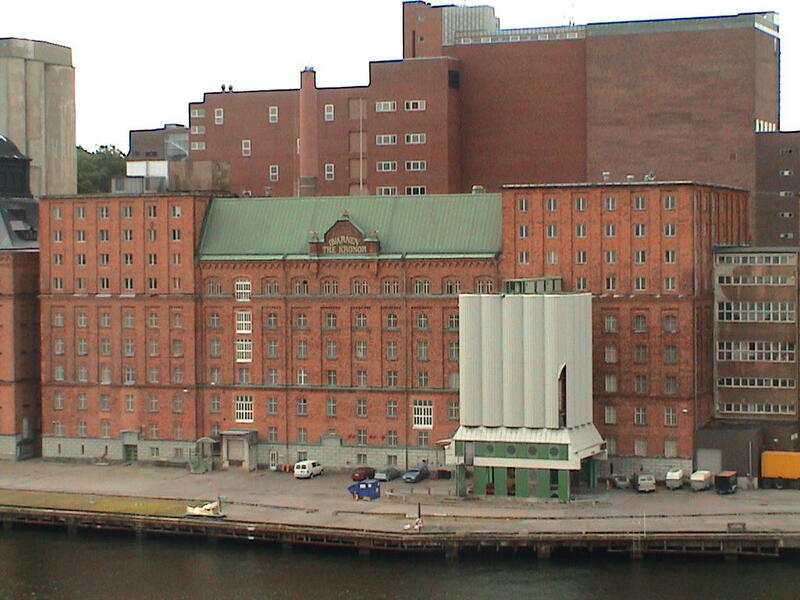 The buildings looked similar (to Finland) from a distance. As the port came closer, ppl rushed towards the exits. The cruise staff had taken pictures of everyone while entering the ship and had displayed them for ppl to make it theirs for an exhorbitant sum. Yet, we all indulged and took a copy each of the rather silly looking pictures because after all, one doesnt go to Stockholm on a cruise everyday. The large crowd did what was expected. Due to us being such a large no of ppl in the group (8), and each one being at a different location when the ship touched land, we all got separated for some time. Six of us managed to find each other outside at the Viking line terminal but two duds got so late, that we missed the bus tour which left from the terminal once a day. 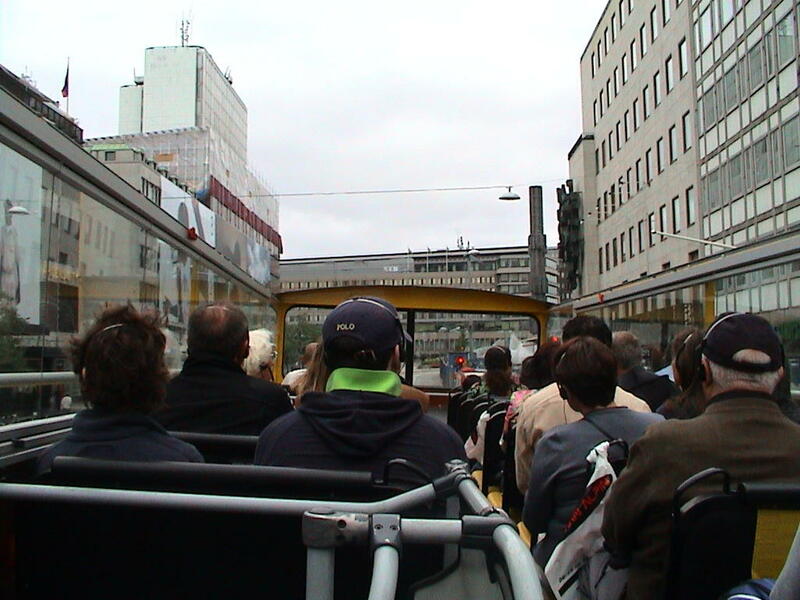 Eventually we took local transport (had already converted to local currency – Swedish Kronor – in Helsinki) to the city railway station. From there, we took an open top, double decker, hop on-hop off bus, the sorts that Shah Rukh Khan has crooned and kareened in, in many movies. The plus point of these was that one could get off at any stop in between, visit the place and then hop on again into any of the later buses. It also had headphones for an individual audio tour in many languages, which gave a commentary about the various places being passed by. Thus, we passed by the cultural centre and Sweden house. We got down to see the famous Vasa Museum, which is a museum built around a ship. This ship was made in early 17th century and on the day of its maiden voyage, in all splendour, the ship sank, the moment it set sail (in 1628). A case of bad design it seems. The ship was salvaged in 1961 and a museum was built, after restoring the worlds only 17th century ship to what it would have looked like then. We were told that our exorbitant “hop on – hop off” bus ticket included free admission to almost all museums, but that was not the case. Thereafter the hop on – hop off bus got coined as the hop on, hop off and f**k off bus. Eventually we checked out Vasa museum from outside. There was another museum nearby which we went to and then waited to hop on again, since we didnt have much time in Stockholm either. We passed by City hall, where the Nobel prize banquet is held every year, the opera and some theatres. We also passed by the open air museum (Skansen) and the amusement park – Grona Lund, where we were entitled to free rides (for sure this time). But since we didnt have time, we didn’t venture there. 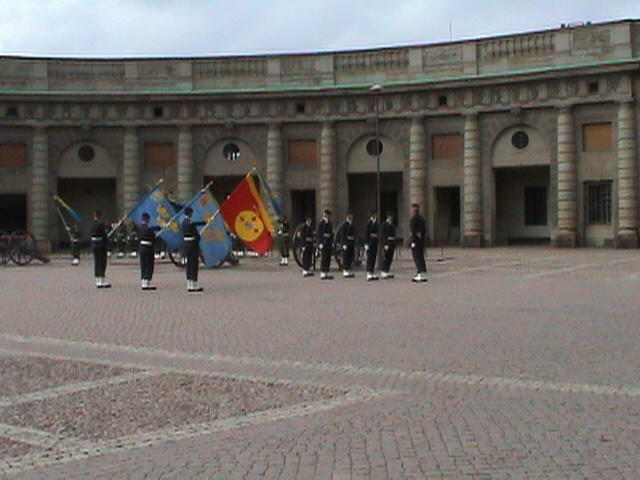 Next we got down at the Royal Palace, where we asked a rather stern looking guard when the “change of guard” would occur. Luckily we were just in time for that ceremony. We found some spots which provided a good view of the ceremony (yours truly being in front of a mob in full camerawoman style). The “change of guard” was a typical formal, military affair and nice to watch. Immediately after the ceremony got over, the military band broke into ABBA’s “Dancing queen” much to our surprise! After the change of guard, the new guard at the entrance was a rather cute looking young chap, with whom yours truly got a picture clicked. Unfortunately he looked more like a stiff mannequin than a real human being. By the time we got free from this place, it was already past lunchtime and all of us wanted to grab some lunch. We again hopped on into the f**k off bus and got off at the stop no 9 (Sightseeing boats) and went to the Central station once more (stop 13), this time on foot. Everyone had something at Burger King with the exception of yours truly who had Thai food. After a sumptuous meal, we were barely left with just enough time to walk back to the Viking line terminal in time to board the ship on time. The hop bus would have taken a complete circle of the whole town and that would have been too late. The best way to see a place is anyway peripatetic. So we gathered our maps and our bearings and walked our way to the ship. On the way back, we went by the narrow cobblestoned streets of Gamla Stan, saw the sparkling water all around and the various ships and tours available to the Viking village. I personally didn’t find much difference in Stockholm and Helsinki. The architecture seemed the same due to the Swedish influence in Finland. Only the signs were not bilingual but only in Swedish this time. The same brands and the same stores are in both places. I didn’t even feel as if I visited another country due to the seamless integration of EU. The only difference is that Sweden doesn’t use the Euro as its official currency, otherwise everything else seems the same. A few things reminded me of back home though. For some reason a lot of the crowd in the cruise consisted of Bangladeshis. Also, surprisingly there were tongas being used in Gamla Stan! One of my colleagues even distorted Gamla Stan to gamlistan and then to gulistan. 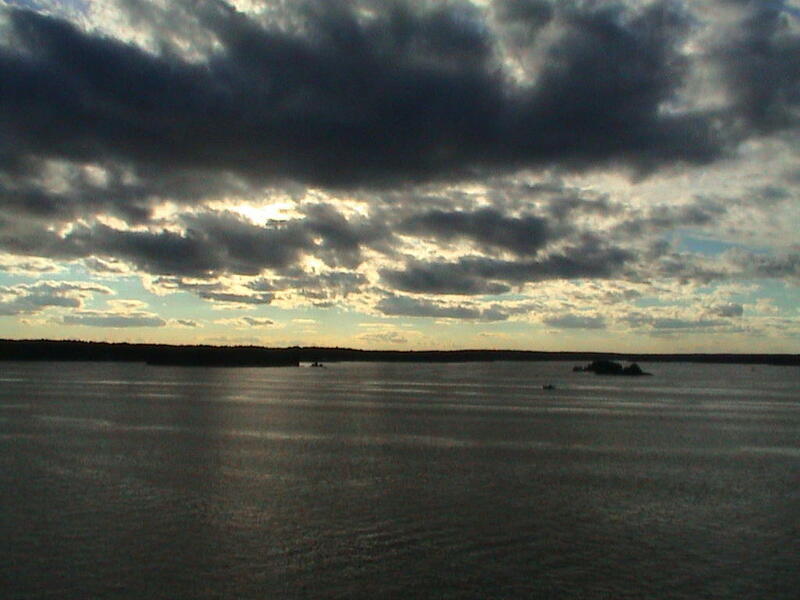 Here’s a nice bird’s eye view of Stockholm. It has overhead videos and is really like flying to that place. After getting into the ship, once again it was some more of the sun deck followed by some more music, dance and drinks, since it got quite cloudy instantly. There were lots of pets on board and I met a couple of them. Pendo and Jerry were two of the dogs I met. Pendo is an Alsatian, known as German Shepherd in this part of the world. The ship even had a pet’s corner. On the return trip, we had the tax free shopping to take care of. I bought loads of chocolates. We also had the karoake bar to try again. But this time again, by the time we got to the karaoke bar, the timings were already over. We went exploring the lower decks of the ship which were meant for the cars and other vehicles. Unfortunately, we were imagining them to be in some large yard kind of thing, but it wasnt like that. We couldn’t see anything except for endless rows of cabins. We also visited the Sauna centre and managed to take a peek in as it was closing down for the night. After partying for some part of the night, we retired slightly early as we had to get to our workplace, straight from the terminal the next day. The next morning, 8 weary travellers got off at the Viking Line terminal at Helsinki, tired, hungry and pleased.